I have always been a very active individual. For every season in my life, I have jumped head first into one sport or another. As a child, I rode horses, and then I spent a number of years in karate. When I was twelve, I turned in the karate belts for figure skates, and quickly found a love for ice dancing. I competed in figure skating, and taught Learn to Skate through middle school and high school, and then took a break from my skating to focus on my education. While getting my undergraduate degree at Malone University, I met my future husband, who happened to be a cross country and track athlete. It didn’t take me long to decide to try running, and by my junior year, I walked on to the track team. After graduating, I followed my husband’s interests and dabbled in competitive mountain biking. While mountain biking is quite an invigorating activity, I missed being in a graceful and artistic sport; it was then that I found yoga. Within a year of starting yoga, I decided I wanted to teach it. I have always enjoyed physical activity, but there was always an underlying tone of needing to measure up, of needing to be good enough, but in yoga, it was different. Yoga changed the way I viewed exercise, and it began to be a way for me to take care of myself. Yoga made exercise empowering for me, it was a chance for me to joyfully explore my own potential, rather than a need to live up to the perceived expectations of others. After graduating yoga teacher training, I immediately began teaching, and discovered my calling as a fitness professional. Teaching others, helping others find joy and excitement and fulfilment in exercise brought me a newfound sense of direction and purpose. While continuing to teach yoga, my former figure skating coach introduced me to Beachbody, and this wonderful thing called HIIT (high intensity interval training). The combination of yoga and Beachbody fed my need for beauty and grace and peace (yoga), while also satisfying my need to explore my own limits and to keep my competitive nature thriving (Beachbody). Over time, I started to explore the idea of becoming a trainer. I reached out to one of the Beachbody trainers, and he encouraged me to go after my purpose, which I knew was to help others find their voice and power through fitness. I got certified as a personal trainer through NASM, and I have never looked back. There is so much power in believing in others, and as a trainer, I want to be that cheerleader for my clients. I am completely convinced in one’s power to create one’s dream life, and it is my calling to help my clients discover just how strong, capable, and powerful they really are. “While I usually approach workouts feeling tired and reluctant, I ALWAYS leave feeling invigorated and glad I made the effort. 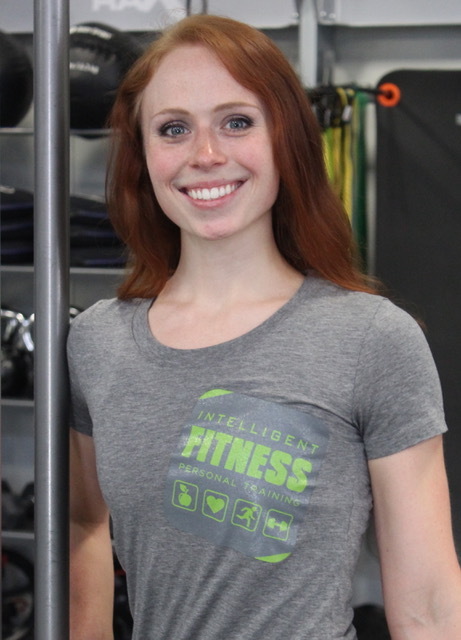 Hannah has the ability to push as needed without being pushy and always makes the workout all about what I need most. She’s a very sharp coach and a great motivator. ~D.B.